Every time we work alongside the community to solve a problem; every time we experiment with a new design or a new technique; every time we overcome a new challenge – another opportunity presents itself to share what we ’ve learned with others. 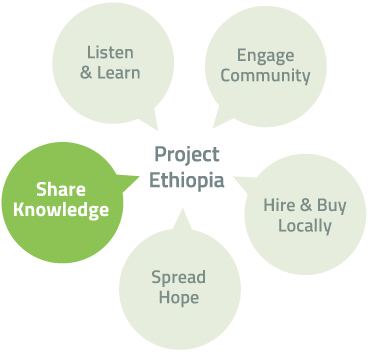 Sharing our knowledge with others, both in Ethiopia and beyond, is not only a powerful practice of Project Ethiopia, it is essential to our mission and vision. Most of the villages with whom we work are within walking distance of one another so knowledge, skills, and education are easily communicated from one village to another. 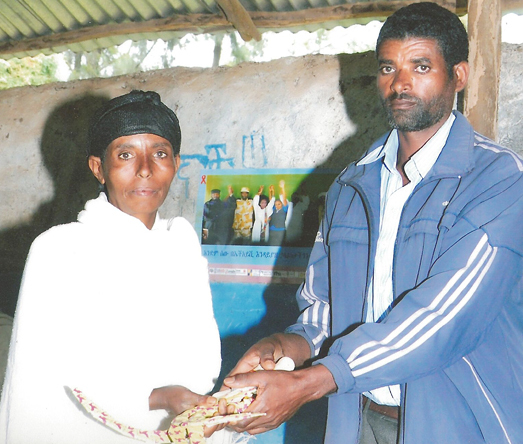 Villagers who have been trained as cement masons, concrete block makers, metal workers, well-diggers and toilet floor makers can support families in their own community and spread that knowledge to others in nearby villages. The ripple effect at work again! Saving crops and land when the rains last months longer than usual. Eliminating pesticides that harm bees and learning the skills of bee keeping. Fertilizing crops with diluted urine collected from Project Ethiopia latrines. Setting up and growing a savings account. 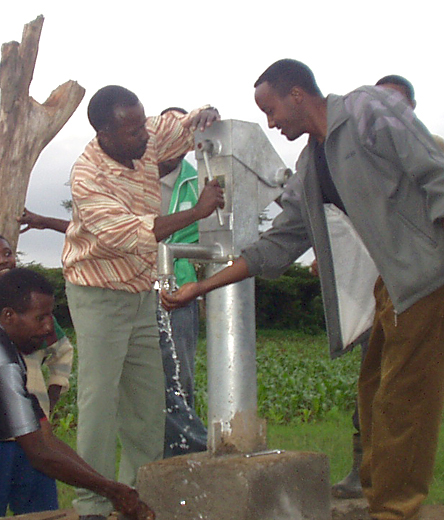 Because the community works alongside the Project Ethiopia team as wells are dug and installed, villagers understand how to make the necessary repairs when problems arise. For example, water from the well at Bacha school was coming out cloudy. Villagers who helped install the well were gathered to assess the problem and very quickly were able to pull out the 25 foot pump pipe and clip about two inches off the bottom of the tube as it was drawing up silt along with the water. Within less than an hour the well was pumping clean, clear water for the students. $75 will provide a Farmers ’ Association member with a variety of farming tools to support their crop production and yield.